The Hydro Cart has the unique ability to product a high volume of ultra pure water to allow for window cleaning safely from the ground using water fed poles. The modular system approach allows the Ultra Pure system to be used as a compact and portable system that is easily moved in and out of vehicles, up and down steps and across any terrain. You can use the Hydro Cart using normal tap pressure (tap pressure varies by location). The 4 stage filtration system which includes reverse osmosis, and deionization process to produce mineral free water providing for incredible cleaning action and spot free windows. 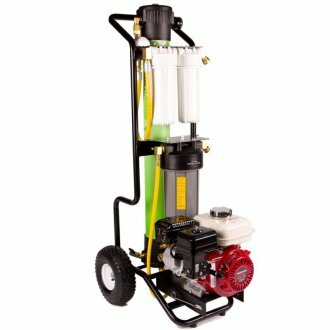 The Hydro Cart is equipped with an electric motor to increase productivity in low water pressure areas or when two-pole cleaning is desired. Includes 100’ of industrial hose.